Jonghyun, a member of the K-pop band SHINee, said the song "Deja-Boo" best captures his musical style and color. "I personally like this song a lot, and that is the reason behind selecting it as one of the two title songs of the album," the singer told the media before a live showcase on Thursday at the SMTOWN Coex Atrium in Samseong-dong, southern Seoul. "That is also why I decided to prerelease it." The singer wrote lyrics to every song on his first solo EP, "BASE" that consists of seven tracks, including the two lead tracks, "Deja-Boo" and "Crazy (Guilty Pleasure)." The funky retro song "Deja-Boo" topped local music charts, including Genie, Melon and Naver Music, upon its release Wednesday. "To be honest, I am not confident in singing ballad songs," the singer said. "Fans have loved my ballads in the past, but I am not really good at singing them," he added. "For this album, I focused on introducing my style of music and what I would like to pursue in my musical career." That is why the album was named "BASE," he explained. "I wanted to make an album filled with songs I like, and work with musicians who inspired me." Some renowned musicians and artists collaborated with Jonghyun on the album. "Deja-Boo" features hip-hop musician Zion. T.
Younha, Wheesung and IRON also participated on the album. "When deciding who to collaborate with for this album, I chose artists who can express the songs best," said Jonghyun. The singer added that he has looked up to singer Wheesung as his personal idol. "I studied writing lyrics through his music," he said. “So I asked him for help in this album, and he gave me the lyrics to the song 'Hallelujah.'" Jonghyun’s solo venture follows the release of fellow SHINee member Taemin’s first solo EP, “ACE,” last year. 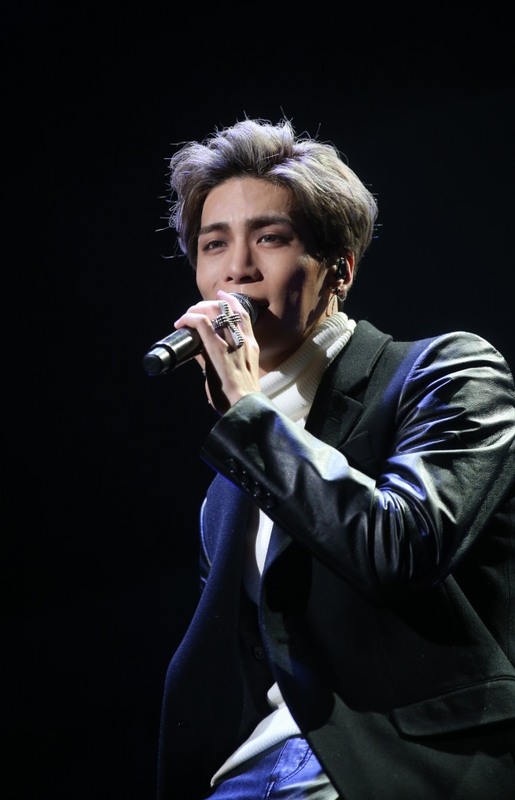 Jonghyun said that although he performed on stage alone, he could feel the presence of other members cheering for him. “BASE” will be available for purchase both online and in traditional stores starting from Jan. 12.